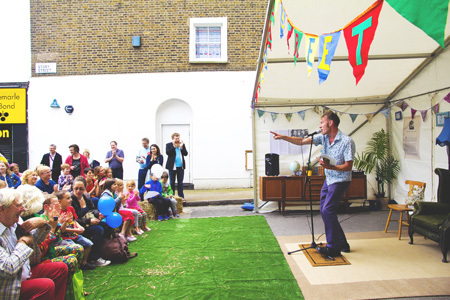 Sunday 17 June 12-6pm – Story Street (off Caledonian Road) -part of the Cally Festival, a huge one-day street party on the Caledonian Road. Presented by Word Festival’s very own poet-in-residence Paul Lyalls, Story Street will see storytelling, poetry, rap, spoken word and readings, with performances from local people and well-known poets and storytellers – including pupils from Thornhill, Copenhagen, Vittoria and St. Andrews (CofE) Primary Schools, Key Changes artists and more. Come and pull up a hay bale and enjoy the show.